What does Small Business, Big Vision mean to you? I’ve met hundreds of entrepreneurs over the past 20 years or so, and even though they might be called “Small Business People,” true entrepreneurs aren’t small by any other measure. Maybe they’re solo-preneurs or have modest revenues, but their work ethic, their fortitude, and their vision are often huge! We entitled the book Small Business, BIG Vision to reflect our belief that it’s not the size of your company that matters – it’s the size of your vision that carries you through all the challenges of entrepreneurship and really makes the difference in whether you succeed or fail. Why do you think Wiley choose you and Matthew to write this book? Because we’re awesome of course! 🙂 Ok, actually there were a few factors. Both Matthew and I write a lot – for the sites we’ve founded, like YoungEntrepreneur.com and Blogtrepreneur.com, as well as guest articles on Business Insider, Entrepreneur.com, and several other sites. So Wiley knew that we were able and willing to write about entrepreneurship, and that we are very interested in helping entrepreneurs to become successful. They had also taken notice of our first book, Kidpreneurs, which has done very well. Most importantly, we have a large following. Something you learn very early on when dealing with a publisher is that they expect you to do the bulk of the promotion for your book. Unless you’re a celebrity or other big name, they aren’t going to pour tons of money into marketing for you. So they’re primarily interested in authors who already have a strong following. With over 500,000 monthly readers on our sites, and a strong social media presence, our ability to promote the book was an important factor. What was it like working with Wiley to create this book? Wiley has been great to work with! They’ve been very supportive without being intrusive at all. To be honest, I expected them to want a lot more input on the book’s contents than they did. Of course they edited it, but they left the core of the content up to us, which we thought was great. We started working on the book a little over a year ago. One thing Wiley made clear from the start was that deadlines were very important and not flexible. It was critical that we turned things around in the time allotted. We had a deadline of last November for the first half of the book and late January for the remainder. From there, we went through several rounds of editing, we worked with them to create an awesome cover, got final approval on everything around June, and we started promoting in earnest about a month ago. It’s been quite a process, but really a blast! How is writing a book similar to building a business? Just as with a business, you have to plan out your book and stick to your plan. As I mentioned, deadlines were important, so we had to follow a writing schedule and stay focused. Now that the book is about to be released, it’s a lot more like a business. We’re now in the business of promoting and selling books! We built a website, hired a social media company, and we’re doing everything we can to get the word out. For us, this is the fun part! Why did you decide to include advice from other entrepreneurs? We’ve been interviewing successful and up-and-coming entrepreneurs for several years now, and we’re always amazed at the insights and ideas we gain from those encounters. We wanted to pack Small Business, BIG Vision with value, and getting the inside scoop from a number of highly successful business superstars delivers that value. The profiles also serve as validation for the concepts we present in the book. Matthew and I have been entrepreneurs since we were in grade school, so we definitely know what we’re talking about, but not everyone has heard of us. It’s one thing for us to say, “This is how you should do it,” but when we can present an example of someone who has been successful implementing what we’re suggesting, it’s much more impactful. What’s the number one takeaway from the book? 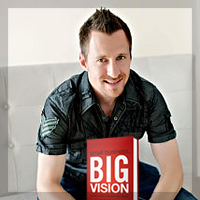 Throughout the book, one thing we demonstrate over and over is how important vision is to your success. Without a strong vision, it’s difficult for an entrepreneur to put their all into their business – something you have to do if you hope to succeed. If you’ve got a BIG Vision, and it’s strong and clear in your mind, that will get you through the inevitable obstacles that every business owner encounters. It keeps you going when you might not otherwise feel like working on your company, and it prevents you from getting sidetracked by other opportunities or distractions. Having a vision for your company is more than just daydreaming about where you hope to be someday. It’s about knowing exactly what you want to accomplish through your business and what that accomplishment will mean to you, your family, your market, and the world. Getting crystal clear on that picture – and then working on a plan to make it happen – can make a bigger difference in your business than just about anything else. To implement the BIG Vision concept, start by devoting some dedicated time to creating a detailed picture of what you want to accomplish. Make creating and solidifying your vision as important as any other task or project you have to do for your business. From there, make sure everything in your plan for your business supports your vision, and work to get rid of anything that doesn’t. Then make sure everyone involved in your business understands and supports your vision. Do all that, and you’ll fast-track your way to success. Use the principles you documented in Small Business, BIG Vision to sell this book to me. Our objective with Small Business, BIG Vision was to provide useful, practical, actionable information that the reader can put into practice immediately. From planning (even if you already have a business plan) through turning around a struggling business, and everything in between, we cover a wide range of must-know material. Then we back up and reinforce the ideas in each chapter with profiles of successful entrepreneurs who have used the same principles to excel in their own businesses. If you’re an entrepreneur, this book was written for you. And it was created with the sole purpose of helping you dominate your market. The bottom line is this: If you don’t get the book, just hope your competitor doesn’t either! Alright-y folks. You read Adam’s bottom line. Sure it might be superfluous to think that your competitors will out-business you if they read this book and you don’t. But I’m a big believer in learning from people who are much smarter than me, and reading their book is the cheapest way to learn first-hand from their entrepreneurial careers. I just bought my copy. You can do the same here.. I think they chose a great title. In order to be successful you really need a BIG vision and ready to take some risks. Yeah, that was the first thing I mentioned to Adam when I heard about his title. I think it’s perfect. BCA: Yes, having that BIG VISION is a MUST! Nicholas: Thanks again for the interview. Great questions and congrats on your new site 14clicks.com! I’m enjoying it! Sure thing, Adam! I hope the book launch is going well and thanks for taking the time to stop by.